What You Should Do When There is a No Oil Pressure Warning in Your Volvo? The no oil pressure light blinks on in your Volvo — what do you do? It may seem pretty self explanatory, but sometimes a no-oil pressure warning can be something as simple as a sensor going bad. Below is some information about what the light can mean and how to respond when you see it show up on your car’s dashboard. What is the No Oil Pressure Warning? Your vehicle will tell you when it needs almost anything. These days vehicles tell you when your tire is low on air, when your engine oil needs to be changed, if your washer fluid is low, and so much more. 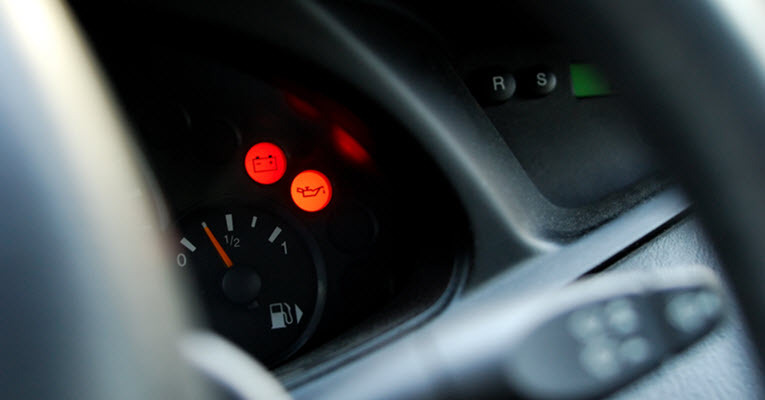 A no oil pressure warning could mean many things, but at the very least it generally means that you should not drive your vehicle any further unless you have it checked out. This warning generally means that your motor is not getting the proper oil pressure it needs to function properly, and on a general basis this means do not drive your vehicle any further. While it could be something mostly harmless like a bad sensor, you don’t want to take the chance of ruining your engine until the vehicle has undergone a thorough diagnostic by a reliable service technician. What Causes the No Oil Pressure Warning? There is a long list of things that can cause this warning to occur. Some of them could mean there is actually no oil pressure while others could just a faulty sensor. Let’s take a look at some of the more popular reasons you get this warning. There could simply be no oil in your engine. If this is the case, there may be a larger problem elsewhere, so your vehicle needs to be seen by a professional. Generally before this happens you will get a warning to add oil to your vehicle, but that too is no guarantee and this is why it is best to have your oil checked regularly. This could potentially cause permanent engine damage. There could be a faulty oil pressure sensor, which is telling the computer that there is no oil pressure when there really is. It is a common occurrence with aging vehicles and can be fixed by taking your vehicle to the pros at Hayes European. Your oil pump could be on the fritz. This means that there is no oil being pumped from the reservoir to the motor. Your motor needs this oil to lubricate and cool the moving parts inside of it. This too can cause possible permanent damage to the engine. The oil pick-up tube for the oil pump could potentially be clogged. If this happens, there again will be no oil being picked up and pumped through the motor. The oil in your motor is essential as it is the lubrication that keeps the parts of the motor moving freely. Without that lubrication your motor can seize up and not work at all. This is probably the least likely of the causes, but it is still possible. The computer is the main brain of the vehicle telling it what to do and when to do it. It is what monitors the temperatures and levels of pressure and other fluids the vehicle needs to operate in good function. When the computer goes bad it can send faulty signals and make you think that something is wrong when it isn’t. When you have a no oil pressure warning, it is a serious matter. Not having oil pressure in your vehicle could mean permanent damage to your vehicle and leave you walking when you don’t want to be. To avoid irreparable damage, when you see this warning, come see our service technicians at Hayes European. Convenient to the Santa Cruz, Aptos, Soquel, or Capitola, California areas, we employ experts in European vehicles, so we can always take the best care of your Volvo. Call or stop by today to make an appointment, whether your Volvo has a no oil pressure light on or you just need some routine maintenance to keep it running smoothly for a long time to come. * Volvo XC90 image credit goes to: teddyleung. By AkamaiAssist| 2018-09-17T14:21:58+00:00 September 3rd, 2018|Volvo Repair|Comments Off on What You Should Do When There is a No Oil Pressure Warning in Your Volvo?